In my book The Israel Deception, I show that a major catalyst for the engineering of World War I was to facilitate the breakup of the Ottoman Empire by the Rothschild banking syndicate in order to establish a foothold in the region for its newly found oil interests under the guise of 'creating a Jewish state'. As per the Rothschild Zionist promise to the British, to take America into the war, they decide they want something in writing from the British to prove that they will uphold their side of the bargain. 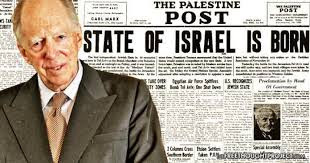 The British Foreign Secretary, Arthur James Balfour therefore drafts a letter which is commonly known as the, "Balfour Declaration. And while the end of World War I did bring about the breakup of the Ottoman Empire, it would take another devastating war 20 years later before the Rothschilds could seize their 'Jewish State' through the newly formed United Nations. Now if we fast forward a century later to just a few days ago, we saw that several world leaders met in Paris to celebrate the 100 year anniversary of the ending of the War to End All Wars. And perhaps what is the least ironic in this memorial was the fact that the proceedings were led by Rothschild banker (Emmanuel Macron), who dedicated his speeches towards the establishment of a new world order, and even a new European military to protect his master's goal of a one world government. At the 11.11.2018 commemoration of the Armistice of WWI French President and Rothschild Jesuit banker Macron made an unfounded distinction between nationalism and patriotism, saying patriotism is the opposite of nationalism – for “patriotism defends our values”, the moral values the brave soldiers died for in WWI! We are a (Masonic) brotherhood. Even as Macron is zapping Trump for being a nationalist, the French president will be pushing, in Trump’s absence, a whole new initiative built around—you guessed it—globalism. As the Post also reported, “The president plans to fly home just as Macron’s PARIS PEACE FORUM kicks off for three days of meetings aimed at galvanizing global action on shared challenges, such as climate change.” The Post quoted Thomas Wright, a Europe expert at the Brookings Institution, saying that Macron planned the Paris Peace Forum as “a counterpoint to ‘America First.’” Thus we can see: All the “Macron Attacks Trump” headlines are part of a deliberate strategy. Leading up the start of World War I, Europe was a composite of both empire and nationalism as each government saw themselves as morally and racially superior to their neighbors and counterparts. And it was in part the ability of the Rothschilds to use these feelings of superiority to bring about a war that would utterly change the world for nearly 100 years. And when the dust had finally cleared from the repercussions of this war 70 years later when the Soviet Union finally fell in the early 1990's, it opened the door for the Rothschild's to attempt their greatest gambit of a unipolar Europe, and to even instill in France in 2017 their own puppet to be leading the EU on the anniversary of their greatest triumph.